The five-leaf akebia vine, or chocolate vine, is a perennial that is sometimes vigorous to a fault. The chocolate vine gets its moniker from the rich purplish-brown blooms that smother the vine and from the delicate chocolate scent of the flowers. Chocolate-scented flowers are unusual, especially in the form of hardy perennials, so this one attribute may endear you to this flowering vine. Plant the chocolate vine in the spring or fall, in average well-drained soil. If you wish to grow the fruits, plant at least two vines to increase the chances of pollination and fruiting. The vine produces glossy dark green leaves that are oval-shaped, and grow in clusters of five. Vines produce many dangling purple flowers with three petals in the spring (ranging from March to May), and vines sometimes produce fruits that resemble eggplants late in the summer. Fruits are edible, but not very palatable. If you choose to harvest the fruit, you may recognize that the akebia is related to the kiwi, and has tiny black seeds embedded in the pulp. Consider the mature size of the chocolate vine when incorporating this plant into your landscape design. This isn’t a specimen that will daintily clamber up your mailbox. Although the vine doesn’t cling, you can train it up a drain spout or across a privacy fence with the help of some heavy-duty twine or plastic bird exclusion netting. This vine would also be an attractive drape to hide an unsightly chain link fence. Include this vine in the rural garden, as browsing deer usually avoid the plant. Some gardeners appreciate the rampant growth of this vine when used as a groundcover to disguise eyesores like rock piles, tree stumps, or manhole covers but the delicate flowers tend to get lost in the mass of foliage on the ground. Practice good stewardship of the land by not allowing akebia quinata to escape your landscape into neighboring woodland areas. In some areas, the chocolate vine has displaced native plants with its dense vegetation. The vines have the potential to choke out small trees when left untended in wild areas. You may need to check with your local authorities to make sure the chocolate vine is allowed in your area. If it's considered invasive, it may be banned. Flowers and fruits are best in full sun, but the vine is very shade tolerant and will grow in woodland settings. The ideal soil for growing chocolate vine should be loamy with a high percentage of organic matter. The soil should have proper drainage. Provide weekly watering until vines are established, then water during periods of drought so that plants get at least one inch of water per week. The chocolate vine will do best in temperatures between 55 to 85 degrees Fahrenheit. In the harsh winter weather, it may lose its leaves (and privacy benefit) but will regrow in the spring. The chocolate vine is a light feeder and doesn’t require supplemental flower fertilizer. You can provide trace nutrients for vines growing in poor soil by mulching with compost or well-rotted manure. You can propagate the vine through softwood cuttings if you only have one plant. If you want to harvest the seeds, do so once the pods are ripe. Plant them in a greenhouse right away. Shoot cutting is another option. Use one that is at least 6 inches long and from the new spring growth. Plant the cutting in fine compost or a lightweight planting medium. Place it in a humid and warm spot until the cutting roots. Purple Bouquet: Most common in the trade, it is desirable for its compact size, growing about half the height of other varieties. Rosea: Flowers are paler than the unnamed species, helping them to stand out against the dark foliage. Variegata: Showy splashes of white on foliage make an attractive backdrop for pink blossoms. 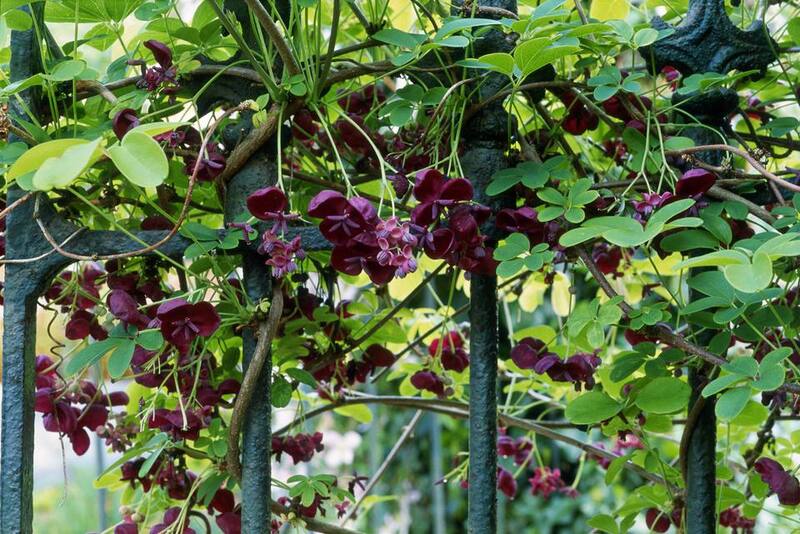 The chocolate vine will climb on supports or scramble up to 40 feet. Because of its vigorous growth habit, many gardeners prune the chocolate vine back to ground level in late winter to keep it in check. You can also lightly prune the vine to help it look tidy after flowering.